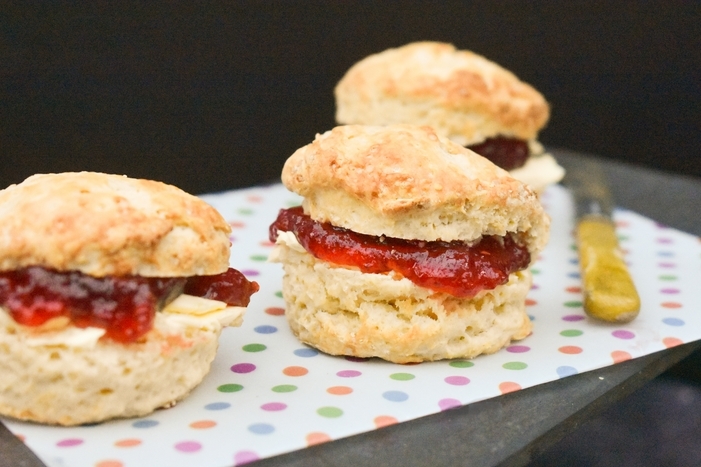 Don't you just love a fluffy, buttery scone? They are so associated with afternoon tea here in Scotland (and in England too), that it just wouldn't be the same without them. I just love them, especially when they're still warm from the oven. 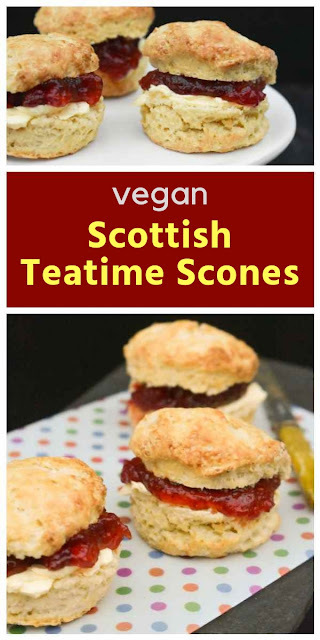 Scones are offered in Scotland as part of a high tea. Have you heard of high tea? High tea is an early evening meal, where you're served a selection of small cakes, including scones after your main meal with a pot of tea. Toast is often served too. It's all included in the price of the meal. Many hotels and pubs offer high teas in Scotland, but you better be prepared to dine early between 4:30pm and 6:00pm. Oh and they are pronounced scone which rhymes with gone. These scones are vegan. I used my traditional recipe for scones and changed the butter to dairy free spread, the plain yoghurt to vegan plain yoghurt (I use Alpro) and the milk to almond milk. It was as simple as that and they had a really good rise and were light as air when you bite into them. All soft and fluffy inside. Who said vegan baking was difficult? I couldn't find my regular cutter for scones, so I used a smaller cutter, which made 12 small scones instead of the 6-8 large scones I'd usually make out of the scone dough. What's the secret to light, fluffy scones? Cold butter or dairy-free spread, straight out of the fridge. When you're rubbing the butter/spread into the flour, don't overdo it, just rub the butter in until it's just combined. When you add the wet ingredients, cut it in with a knife, don't use your hands or a spoon. Bring it together with your hands but don't overwork the dough. The less you handle it the better. Roll it out thickly, 3-4 cm thick. When you cut it, be careful not to twist the cutter as you lift it out of the scone dough or your scones will bake squint, instead of straight up. In Cornwell and Devon scones are served with jam and clotted cream (the name of my friend Beth's blog actually Jam and Clotted Cream). There is great debate down south as to what goes first the jam or the cream. Who knows who's right? I like to serve them still a little warm with butter/dairy-free spread and jam. Some say the word scone originates from the Dutch word schoonbrot or schoonbrood which means beautiful/pure bread or the Scots Gaelic word sgonn, which means a large piece of something. In Scotland they were originally made by crofters with oats and buttermilk on a girdle (griddle) outside on a fire and cut into triangles. They were also said to be named for the Stone of Destiny which stood in Scone, Perth where the Kings of Scotland where crowned. Later scones would be baked in an oven. In the 1800s they became part of afternoon tea when the Duchess of Bedford requested tea and sweet breads. Scones were duly served, she loved them and it soon became a trend that is still popular today. Which shape should a scone be? Always cut scones with a round cutter. It can be plain or fluted, but has to be a circle cutter. If you want triangle scones, bake one large bannock and cut into triangles. Baked triangles of scones are always going to be an uneven bake, quite hard at the tip and lighter at the base, Round is definitely the best option for a light bake all the way through. I've worked out the calories per scone, if you make 12 small scones as I did or 8 larger scones. Adding dairy-free spread and jam will of course add calories. If you make these and are on Pinterest, click on this pin and hit the photo button and share a photo of your scones. It's easier done on a phone or tablet. I love seeing my readers bakes. 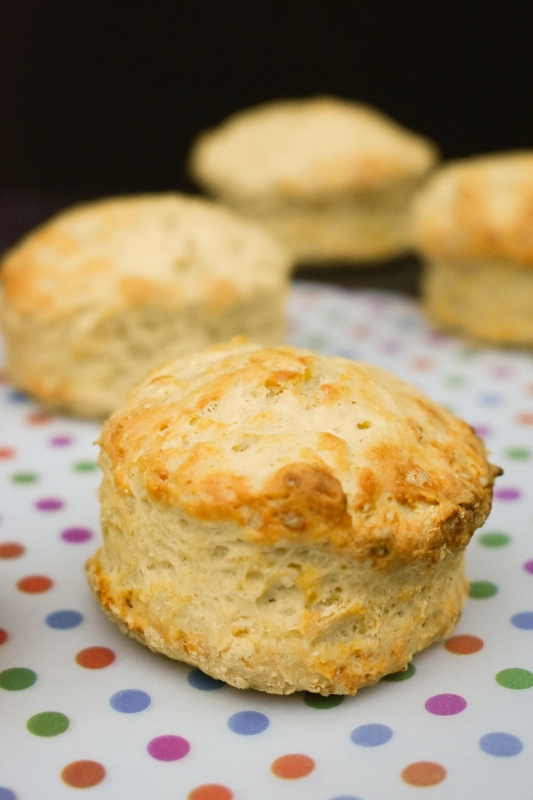 Light and fluffy Scottish scones with a good rise made to a vegan recipe. 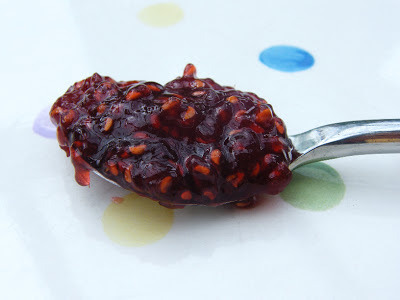 Perfect for a teatime treat with dairy free spread and jam. Sieve the flour into a large bowl, add the dairy free spread and gently rub them together with your finger tips. Gently mix in the salt and sugar. Whisk the yoghurt and milk together in a jug and then pour the liquid into the dry mix and cut into the mixture with a knife until it starts to come together. Finish bringing the dough together with your hands (don't over do it), then roll out to 3-4 cm thick on a floured surface. Cut into circles with a cookie cutter and place on a baking sheet. Brush with almond milk and bake for 12-15 minutes until well risen and starting to turn golden. Serve with dairy-free spread and jam while still warm. 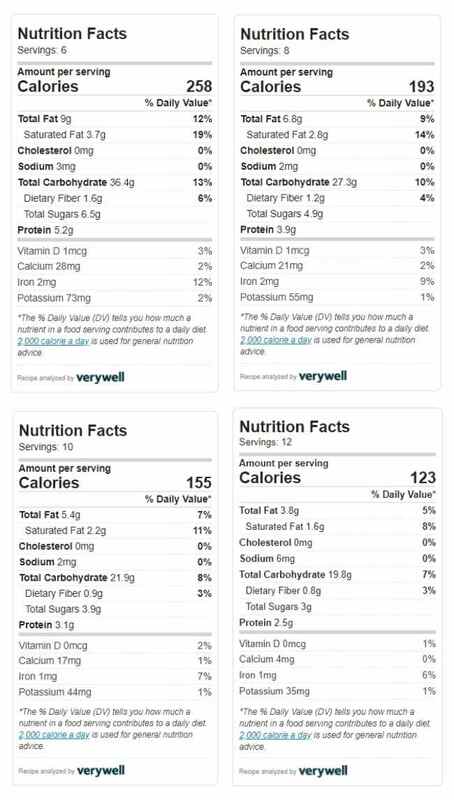 Calories and nutrition for 12 small scones. See above (in post) for calories and nutrition in larger scones. 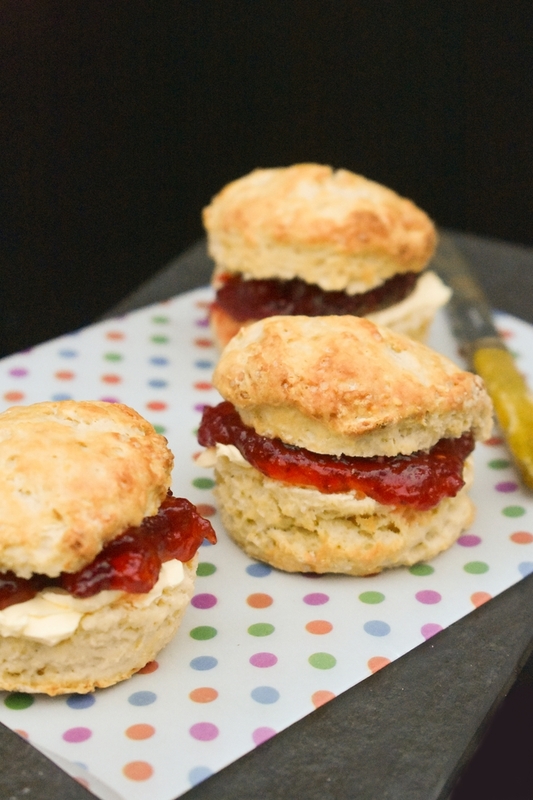 You may also want to have a go at making your own jam to serve with the scones. If so try my Scottish Raspberry Jam. It's easier to make than you may think and no need for a thermometer, just a saucer to pop in the freezer and your little pinky. 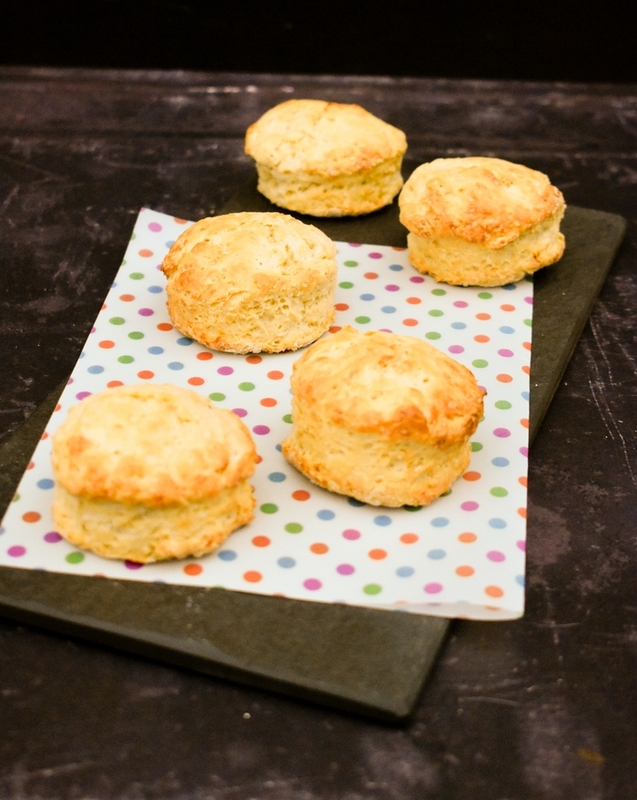 These look absolutely delicious, I love a buttery scone and they take such a short time to make! Yes they are quick and easy to make and so, so comforting to eat. I want to try this! I love that they're dairy-free. And that bunny platter is the cutest thing! Oh do try them, they are so easy. The bunny platter was a gift from my friend Andrew, he remembered me saying I liked them. Such a sweetheart. Wish my husband paid as much attention to what I say, haha! This made me smile, first of all because your scones look fabulous and totally delicious. Secondly, because you make and pronounce your scones in the true Scottish way, I agree with everything you wrote - great job! 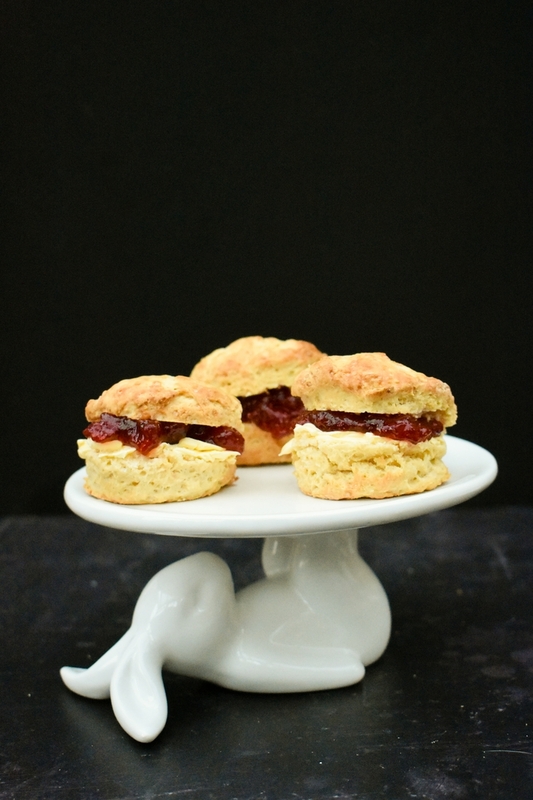 I love scones - but haven't had them for ages - your look delicious and so high and golden. 'Oh and they are pronounced scone which rhymes with gone.' - literally music to my ears. They look so delish!!! Haha yes, so many people aren't sure how to pronounce them. They are certainly delicious. I always feel like vegan baking equals dry or not fluffy. But these look amazing and I wouldn't know they weren't "traditional" if you hadn't said so. Great recipe! Oh no definitely not. I think if you keep things simple and use straight forward swaps instead of adding odd or artificial ingredients, you will get a better result. So many vegan dairy products are great quality now and make good swaps in recipes. Me too and now you mention it, whipped coconut cream would be good on these with jam. Thanks I was really pleased with them. Yes the stand is cute, one of my favourite gifts from my friend Andrew. Such an evergreen comforting dessert! I had no idea they were so easy and quick to make, definitely giving it a try soon! Thanks and I'll fight you to the death, en garde! Haha! 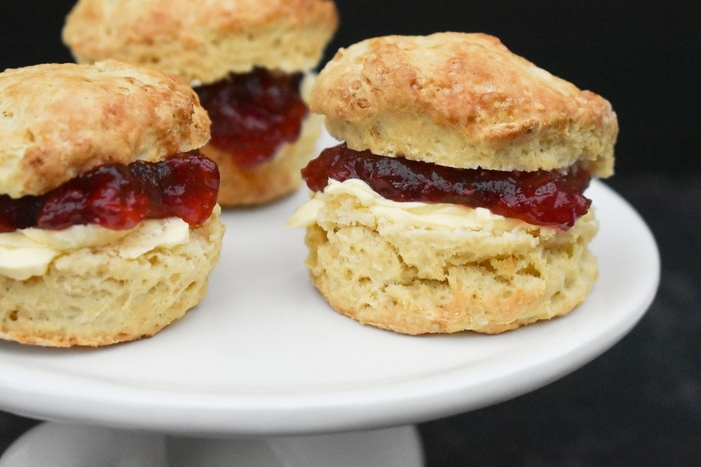 You can't beat a good go-to scone recipe! That is a true story Rebecca. Do you think the scones would turn out the same if I use flour (any kind?) and add the baking powder myself instead of using self raising flour? How much baking powder should I use? I think that should work fine. I would add a tsp. Sorry for the late reply, I had no wi-fi while on holiday.